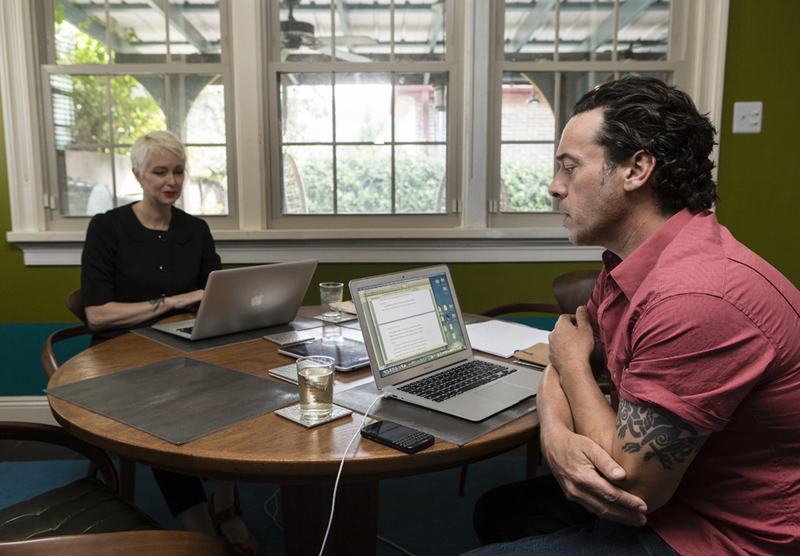 Joseph Boyden’s books reside on a towering wall of shelves in the library of the New Orleans home he shares with his wife, Amanda Boyden (author of Babylon Rolling and Pretty Little Dirty). Last fall Hazlitt dropped by their house—formerly a 19th century corner grocery store—shortly after Joseph’s latest novel, The Orenda, was named to the Giller Prize longlist. Yesterday The Orenda was named the winner of this year’s Canada Reads. Amanda: You know, I’ve had a bad habit of online shopping. I don’t like to go shopping in person and we were living Uptown just off Magazine Street and they had discovered termites in half of the building we were in. We had a two-story apartment and they had to remove an entire wall. So we were living with blue tarps for too many months in a row and I had a novel due, Joseph had a novel due, and we said “Well maybe we should actually consider buying,” so we met with a realtor. I went shopping around online and realized we couldn’t afford to buy anything up over there. Joseph said, “Well, let’s expand the search” and I saw this house, and the listing had coincidentally just been put up that day. I said, “Joseph, I think I found our house!” And it was the first and only house we ever looked at. Joseph: Amanda actually found our dog online, too. We got our house online and our dog online…The house is an old corner grocery store, it was built over a hundred years ago. Amanda: In 1897 or something like that. Joseph: People still come by all the time and say that they remember coming in here when they were kids to get their chips and pop and such. Amanda: It has such a good vibe. It’s filled with people very often. We throw giant parties here. 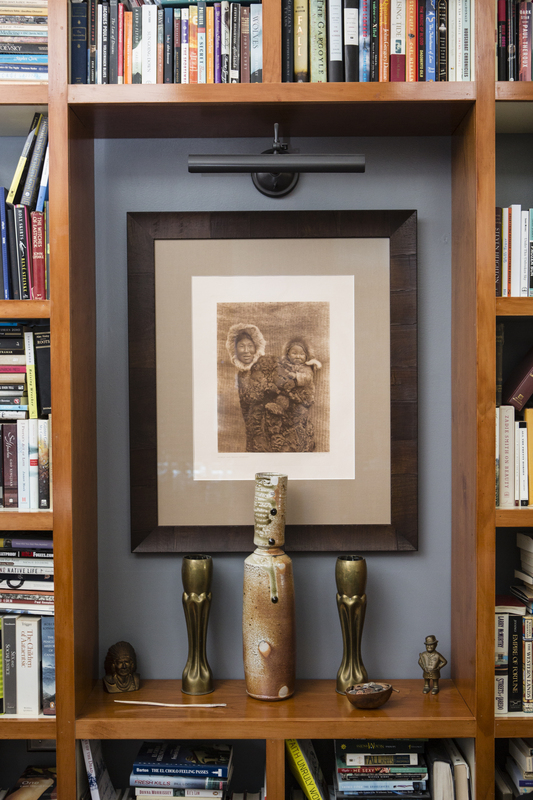 Joseph: Yeah, it’s a great house and our books are our children. I have a son from when I was younger—he’s grown up now, he’s 23—but Amanda and I never had children so we look at our books as our kids and we love to have great gatherings. We do huge crawfish boils in the spring. And actually for a Canadian I’m getting pretty good at boiling crawfish. We love nothing more than to gather our writing students and our friends. Amanda and I are writers-in-residence at the University of New Orleans and we enjoy throwing great big welcoming parties. 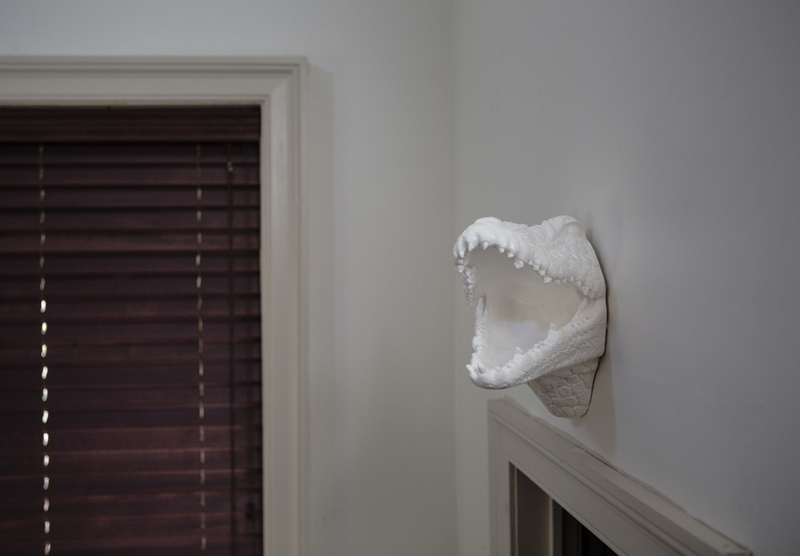 We just had one a couple of weeks ago for the new students in the MFA program and the house was packed. But it’s a good house for that sort of thing because you can wander around everywhere and nothing is overly sacred with us. Joseph: We have huge Saints parties here. The one we had this past Sunday was much more intimate. We had about 25 good friends with us. We’ve had gatherings where we’ve had, like, 100 people come by. We have TVs going with the game on them throughout the house. Joseph: Oh, I’ve got all my research books. I have a research cubby for them. Amanda: He has a cubby. Joseph: Children of Aataentsic is one. This novel is about the mid-1600s in what is now present day Canada. The Jesuits coming to bring Christianity to the heathens. Research books were the big focus. There’s not a ton of novels about that period. There’s one novel called Black Robe by a guy named Brian Moore. It came out in the ’80s and was a hit, but he got the native people really wrong in it and I wanted to correct that. I wanted to correct the history that I think he—you know, I don’t like to speak ill of the dead, he’s dead now—but I wanted to correct some of the misrepresentations of that novel. Joseph: Yeah, The Jesuit Relations is one. The Jesuits kept records, like they kept diaries of their time in the wilderness and sent them back to France to their superiors. And so these are direct diaries I’m reading of the time period of their experiences with the Indians. And a great non-fictionbook called Champlain’s Dream. 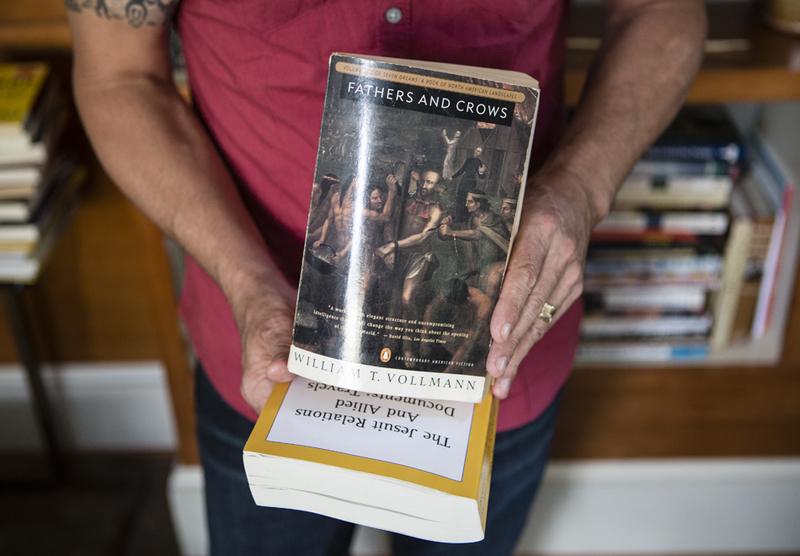 Another book is called Fathers and Crows by William Vollmann. Do you know his work? He’s been writing the history of the world through fiction and these giant tomes. He’s a fascinating writer. Fathers and Crows had a big influence on me. It’s very different. Joseph: He’s a Canadian writer, but not obscure by any means. He’s huge in Canada but in the States he wasn’t as well known. So I was fascinated that Amanda knew who he was. Joseph: A Confederacy of Dunces. I read it in graduate school and thought it was a hilarious and very strange storyabout a strange city. And then I read The Moviegoer and I’m not a big fan of that book. Also, I was reading Richard Ford while he was living here. He was like the idol many young writers looked up. He was this great American writer living here. This is such a writing city, you know. Amanda: I would start with Louise Erdrich’s The Round House. I’d give almost anything of Margaret Atwood’s. Joseph: For younger students I still like to give them Jack Kerouac’s On the Road just because I think it’s a novel filled with such life and spirit. It’s a hugely popular novel but not everyone likes that book. I also like Wells Tower, he’s an amazing writer. Everyone’s waiting for his novel. And Cormac McCarthy’s The Road. I like a lot of his work. All the Pretty Horses. The Outsiders by S.E. Hinton. And they weren’t reading it so I grabbed it and just ate it up, and was just blown away by the. That’s when I knew that I wanted to pursue writing. Amanda: I was reading a lot of collections of short stories, oddly they were sort of popular back in the late ’80s and early ’90s. I was bartending and waiting tables just to make ends meet. I don’t remember many specific short story writers, but the one that sticks out most is Lorrie Moore. I just think she’s fabulous and I thought, “I will never be that good. I will never be able to write like Lorrie Moore.” She intimidated me into going into an MFA program, you know. But it was like the best sort of intimidation. Joseph: Amanda and I actually write sitting right across the table from each other. Amanda talks way more than I do. Amanda: That’s so not true. So not true. Amanda: I didn’t say that. I did not say that! Amanda: I said I didn’t think it was functioning the way it should just yet. Joseph: Basically, she basically told me it’s not there yet. And you have to do that. You have to be honest with each other but we’ll also praise each other. She tells me that this new one is my best book. Amanda: It’s my favorite by far. Brett Michael Dykes is the editor-in-chief of Uproxx and a contributor to the New York Times.